Last time we discussed the EXIF (Exchangeable Image File) information ( Photo Take Date & Time, Exposure Time, F Number, Light Source, ISO Speed, Camera Make & Model, etc.) that is stored within the photo taken by many digital cameras. I showed you how you could extract this information in IrfanView (http://www.irfanview.com). I have since found another free program that extracts EXIF information. It is called EXIF Image Viewer and available at http://home.pacbell.net/michal_k/exif_v.html. The program allows for export of the EXIF info as a text file. Canon and Nikon digital camera owners may find this program especially useful as the Columns tab on the Options screen under Tools & Options sports specific buttons just for Canon and Nikon users. However, this program does more than just give detailed EXIF information. As the name states, it is also a Image Viewer (for JPEG photos only), providing an easy way to scroll through your many digital photos and get them organized. You can view photos as thumbnails or open them individually and zoom to the desired size. The program performs a few minor photo image manipulations such as resizing and lossless rotation. The resulting file can be saved (exported) as a JPEG or BMP and a suffix can be added to the file name (to help with organization). These operations can be done on individual photos or as a batch (by highlighting more than one photo). However, unlike IrfanView, the processed photos will no longer contain the EXIF information and files exported in the BMP format are not recognized by the EXIF Image Viewer program. Additional features of EXIF Image Viewer includes capability of adding or editing photo descriptions which can be saved within the photo and viewing of a histogram with the color data for a selected photo. EXIF Image Viewer contains a very good Help file explaining its functions and capabilities. The program is a relatively small 469 KB zip file download which contains the 656 KB executable, a ReadMe text file and a Compiled HTML Help file. What I really like about this program is its simplicity. EXIF Image Viewer is a plain executable. Just double-click the exe file and the program comes up. Nothing is installed to your hard drive. There is no setup file with elaborate installation. This program does require two DLL (Dynamic Link Library) files to be on your computer. They are msvcp60.dll and mfc42.dll. I found both on my Windows ME computer in C:\Windows\System. While on the subject of digital camera photos, you might want to take a look at Mediachance (http://www.mediachance.com), a site that offers "Multimedia and Graphics Tools for Everyone." More to the point, Mediachance offers a number of Free Digital Camera Tools at http://www.mediachance.com/digicam/index.html. If you are just getting into Digital Photography, using these free tools could prove to be an easy way of learning to improve the quality of your digital photos without the expense of a full blown graphics editing program. Their Free Digital Camera Enhancer program (DCEnhance 1.3) uses custom image processes to enhance and clean up digital images by smoothing skin and reducing noise. Slider controls are included for Auto Balance, Color, Midtones, Enhance Details, and De Noiser. It has Image settings for Close-up, Mid Details, and Landscape. The program works best on photos with bad light conditions. As with any photo manipulation program, results will be subjective. You vary the parameters with the sliders and decide what looks best. Another of the Mediachance programs I tried is a new one called FilterSIM. What this program does is simulate 65 different Kodak Wratten filters. Selecting a filter from the dropdown arrow allows you to raise or lower the color temperature of a scene. If nothing else this program will give you an education on what various colored filters can do to change the mood of a photo. Each of these Mediachance programs is small (just over 500 KB) and easy to use--perfect for the novice. These programs are indeed free (there are no nag screens) and are downloaded as zip files. Once unzipped there is a readme.txt file and a setup.exe file. Running setup installs the program but nothing is installed to your Windows or System directories. A Uninstall is available in the Add/Remove Programs section of Windows Control Panel, should you so decide. I found no Help file but if you go to the Mediachance web site there is helpful information on how to use the programs. Just have fun experimenting with the programs. As long as you do not click the Save button no harm is done to your original photo. Note that you should not be working with camera originals anyway. Always use work copies. While you are at the Mediachance web site check out their page on the Shareware Industry Conference 2000 at http://www.mediachance.com/sic2000/index.htm. They have some unique 360 degree Spherical Panorama images which can be downloaded into your browser for an interesting interactive experience. You can pan and tilt in any direction as well as zoom in and out. The web is a perfect forum for technology such as this. I know Real Estate brokers are using it. The broker selling my daughter's house had several such virtual walk-through tours of her house. The tours covered both the inside and outside of her house and were posted on the web as an enticement to prospective buyers. Any discussion of digital cameras usually includes the subject of battery life. Many users complain about the short battery life caused mainly by running the camera's color LCD screen. Most experts recommend using rechargeable batteries. But if you are indoors near a power receptacle why not use a AC Adapter and save your batteries. I have seen camera brand specific AC Adapters ranging upward to $30 and more. Veo, my camera manufacturer, sells a AC Adapter specific to my camera for $19.95. I found a better deal right near home. Wal-Mart SuperCenters have a Universal Digital Camera AC Adapter for only $15.86. It is Ambico model D-0920 (http://www.ambicoproducts.com/) and said to be compatible with most digital cameras. The Ambico AC Adapter can supply 2100 mA with incremental selectable output voltage settings from 3 to 7 VDC. It comes with four AC Adapter tips, one of which should fit your camera. Ambico has a AC Adapter Digital Camera Compatibility List at http://www.ambicoproducts.com/d0920_compatibility_2.htm. My camera was not on the list but works just fine with the Ambico adapter. 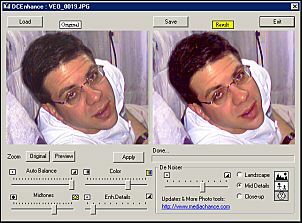 Many people are happy to just display their digital camera photos on a computer monitor. I wanted to do more. Displaying photos on a 17 inch monitor can get a little cramped when you have a group of people. 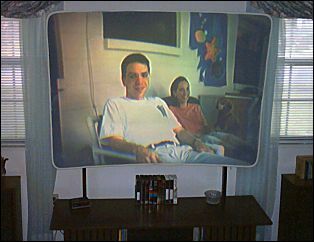 So I thought why not burn them on to a CD-ROM and use a DVD player to show them on a Big Screen Projection TV. I searched the Internet looking for a DVD player that would play JPEG files. After reading over 80 customer reports and comments on VCDhelp.com (http://www.vcdhelp.com) I decided on the Apex AD-1100W (http://www.apexdigitalinc.com/). This model seems to be available exclusively at Wal-Mart. I paid $68.87 last June. You can now buy it for $58.87. For that low price, this unit is a gem! It does so much more than my older $220 RCA DVD Player that I was forced to make the Apex DVD Player my main unit for the Living Room (my Media Room) and relegate the RCA unit to a secondary role in the Family Room. My Apex AD-1100W plays many formats including DVD (Digital Video Disc -- MPEG-2 compression and best quality), MP3, VCD (Video Compact Disc -- MPEG-1 compression and similar to VHS tape quality), SVCD (Super Video Compact Disc -- MPEG-2 compression and similar to SVHS tape quality), CD, and JPEG. I can now burn a CD with over a 180 MP3 music files and listen to over ten hours of continuous music. Or I can play MPG movie files I created on my computer (or downloaded from the web) by burning them on to a CD. It plays raw movie files with the .MPG extension (MPEG-1 or MPEG-2) without having to convert them to the VCD or SVCD format. But, as stated earlier, the main reason I purchased this particular DVD player was for its ability to show JPEGs. Not only does it show JPEGs but it has a built-in slideshow program with 12 different transition effects and automatically resizes photos to fill the screen. You can also rotate images, zoom in/out, and pan. The player seems to work best with photos that are 640 x 480 pixel size or higher. Smaller size photos are auto-enlarged to fill the screen and may look pixelated. I should mention that JPEG photos do look sharper (more detail) on my computer monitor than on my 24-year old Advent 750 analog (before digital and Hi-Definition) 72 inch Front Projection TV. But that is to be expected when magnifying an image to a Home Theater Screen Size. On a standard 27 inch TV the JPEG images are quite acceptable. To find out more about the Apex AD-1100W download its manual from the Apex Digital web site. If reading this review causes you to think about purchasing the AD-1100W, I advise you to first read the reports on VCDhelp.com. Go to DVD Players Compatibility List (http://www.vcdhelp.com/dvdplayers) and Search by Brand for Apex. In the resulting list, scroll down to Apex AD-1100W and in the Reports & Comments column click on View Reports. There are now over 145 reports on the Apex AD-1100W and there is now a difference in capability despite units having the same model number. Some units (like mine with a serial number ending in E05) have a light on the front that says VCD/CD. On newer units with the same model number (but a serial number ending in E08), that light now says only CD. These newer units do not play VCDs. According to the Apex Knowledge Base the VCD format is no longer supported because the added cost of licensing would raise the price per unit to the consumer. They claim the VCD format is not popular and seldom used in North America. Guess they did not think about us consumers with computers that can burn VCDs. According to what I read in the VCDhelp.com Reports and Comments, many computer techies have been scrambling trying to find the older units. 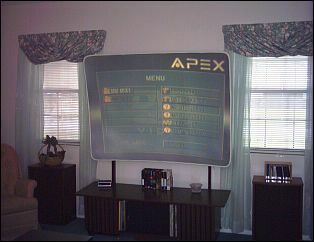 Apex Digital also makes a similar unit, model AD-1200, that is sold by Circuit City and Rex TV for approximately $60. (This unit also is no longer supporting the VCD format according to VCDhelp.com Reports and Comments.) Our SCPCUG Photographer Robin Mills bought the AD-1200 soon after I bought my AD-1100W. The AD-1200 also does JPEGs and MP3s. The difference seems to be that on the AD-1200 model you cannot mix formats on the same CD. In other words Robin has to burn a CD-R with only JPEGs or only MP3 files. When the CD-R is inserted, the AD-1200 automatically recognizes the appropriate format and starts playing. With the AD-1100W model I can mix formats on the same CD-R or CD-RW and then by navigating the CD directories (folders) play any supported format file I like. It is just like navigating directories on a computer except names for folders and files are limited to only 11 characters. Robin asked Apex as to why this difference between the AD-1100W and AD-1200 models. Apex responded that they came out with the AD-1200 model because some people using the AD-1100W complained they found it was too difficult and confusing to navigate the directories (folders) with the remote control. I do not think it is particularly difficult and I for one welcome the directory navigation capability as I am not limited to burning an entire CD-R with only one type of file format. It takes a lot of JPEG photos to fill a 650 MB CD. On average my digital camera original JPEGs run approximately 500 KB. That means I would need around 1300 photos to fill an entire CD. I just do not take that many photos. When I make a backup CD of my computer data files, it usually includes my most recently taken photos. With the Apex AD-1100W I can insert that backup CD into the DVD player, navigate to the appropriate directory, and view my JPEG photos with no problem. Another difference between the two Apex models, which may or may not be important to you, is that the AD-1100W is silver in color while the AD-1200 is black. Either way, if you want JPEG playback capability in a DVD player, check out what Apex has to offer.